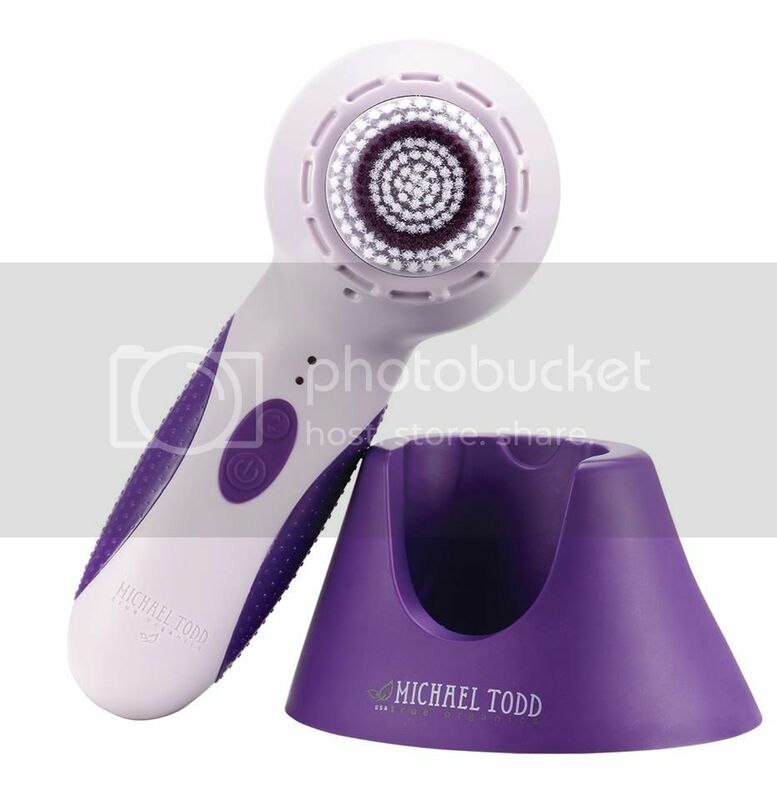 Pammy Blogs Beauty: Gettin' Clean with Michael Todd: The Amazing Soniclear plus two Cleansers! Gettin' Clean with Michael Todd: The Amazing Soniclear plus two Cleansers! Do you feel that your skincare routine needs a little "something" to give it a boost? Are you getting your skin clean enough? In the past few years, I have realized that my skin really needs good and consistent exfoliation to look its best. In this process, I have fallen in love with using sonic brush devices to give my skin a boost. After trying a few, I know that not all of these brushes on the market are created equally. You need a brush device that is truly good for your skin! A good skincare routine needs to combine gentle cleansing combined with proper exfoliation. Not only is this crucial to make you feel clean, it also is what your face needs for good skin health. Effective cleansing will free your skin of pore-clogging dirt, makeup, and bacteria which will allow your treatment products to absorb and work better. Recently, I started using the Soniclear by Michael Todd combined with a Michael Todd's Charcoal Detox and or Cleanse and Tone cleansers.To find out more details about this device and these cleansers, please click "read more" below! Once you start washing your face with the Michael Todd Soniclear, you are never going to want to go back to regular washing again! This brush just gets my skin so clean and leaves me so soft! Initially, it took a few times to get used to the vibrating feeling while using the brush. Once I got used to it, I really liked it! It is almost like getting a facial massage while cleaning your face! So, lets dive into some details and specifics about the brush that set it apart from other brushes on the market. The Michael Todd Soniclear device provides your skin with micro massage cleansing with brush speeds of 100x per second. This brush provides your skin with gentle exfoliation while cleansing your skin and removing impurities and pore clogging dirt and oil. This brush leaves your skin perfectly prepped for your skincare routine and allows your skincare products to absorb better (and therefore work better!). This sonic brush should not be confused with the spinning brush head brushes on the market! This brush provides sonic cleaning (with mircomovement). This is much more gentle on the skin. Plus, studies show that sonic cleansing is much more effective at cleansing that cleaning your skin with just your hands. This brush is even gentle enough for sensitive skin! What is Antimicrobial? 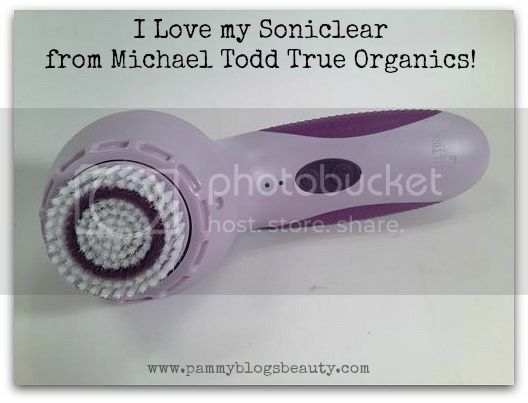 The Michael Todd True Organics Soniclear is a Antimicrobial brush! Skincare brushes in general leave behind residue of dirt, bacteria, and dead skin. This brush has Antimicrobial technology: this brush protects itself from antimicrobial contamination. The germ killing abilities includes the "Life antimicrobial product protection" which is patent-pending antimicrobials and antimicrobial technology. These Lift technologies provide advance protection against microbes (they are unable to reproduce or absorb nutrients). This is an added line of defense and protection against bacteria that other brushes on the market simply do not have. Why risk being contaminated by your own brush device? This brush protects you from that! I use this Soniclear Device from Michael Todd as part of my evening skincare routine. I wet my face and apply a cleanser (I use either the Michael Todd Cleanse and Tone, the Michael Todd Charcoal Detox, or I use any of my other favorite cleansers: they all seem to work great with this device!). Then, I wet the brush of the Soniclear. I turn it on and gently move the brush across my skin with very light pressure. I love that the brush has timed "beeps" that remind you to move to a different area of your face. This entire process only takes a couple minutes. When I am finished, I just rinse my face with water. The effects are so immediately apparent. Even as I rinse my face, I can feel how smooth my skin feels! I follow rinsing with my normal skincare routine: toner (sometimes), serum, and moisturizer. I have been using this device for a few weeks. Previously, I had either been using my hands to wash my face or used my Foreo Luna device. While I still love my Foreo Luna, I have noticed that the Soniclear provides greater exfoliation benefits. My skin is sensitive, yet the Soniclear does not irritate my skin. I think the trick is to use *very* light pressure with this device. Now, if your skin is ultra sensitive, this device might provide too much exfoliation for you. However, I did not get any irritation with my sensitive skin. Since using the Soniclear, my skin's texture has really improved. My skin is so smooth (my skin literally feels as soft as my baby's skin!). Before using this device, I was going through a bit of a phase where my chin and areas around my nose were breaking out more than usual. After a few weeks, my breakouts have seem to have vanished. I also feel like my skin is more hydrated (possibly because my moisturizers are absorbing better?). Overall, I am completely thrilled with my results and am happy to report that I will continue using my Michael Todd True Organics Soniclear as part of my daily skincare routine! With the Soniclear device, I tested out two different cleansers from Michael Todd: the Charcoal Detox Cleanser and the Cleanse and Tone Cleanser. This is a fabulous cleanser for combo and oily skin types. This black gel cleanser works to deeply cleanse your skin. It amazes me how this cleanses so thoroughly; yet, it does not strip your skin nor over-dry your skin. The formula contains activated charcoal in a base of aloe vera (to neutralize acidity and absorb impurities) with sugar cane and maple (gentle exfoliation). This cleanser is totally non-irritating, too. This cleanser works great on its own or combined with the Soniclear! This is currently my favorite Michael Todd Cleanser! :) Note: I find that one pump of this cleanser is just slightly too much product. So, pump slowly to get just the right amount. 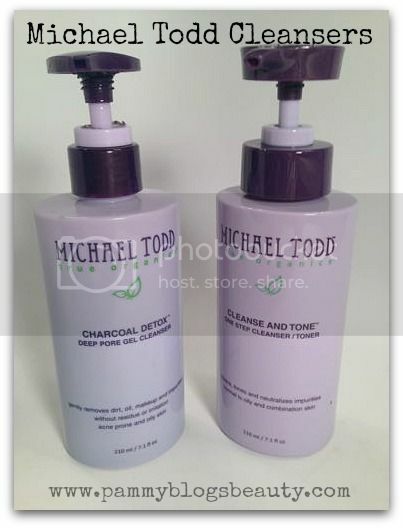 Michael Todd Cleanse and Tone: This cleanser is a "3-in-1" type cleanser that works as a cleanser, toner, and makeup remover. It works to deeply remove impurities while not overdrying your skin. The formula contains active charcoal, antioxidants, organic teas, and essential oils. I like how this cleanses gently and completely without over-drying my skin. Actually, it leaves my skin feeling nicely hydrated. This cleanser pairs very well with the Soniclear device and I like using it on its own as well. I think this is a great cleanser for combination skin (like mine!). Both of these cleansers, combined with the Soniclear device have worked well to cleanse my skin gently and completely without irritation. My skin has been so clean and clear since using the device and these cleansers! Getting your face super clean is truly the perfect start to a good skincare routine! If you are looking for new cleansers or a sonic device, I highly recommend that you check out Michael Todd!